Lauren Medsker turned an annual report about the happenings at a horticultural society into a beautiful and informative story map. The Pennsylvania Horticultural Society won the grand prize in the 2016 Esri Storytelling with Maps Contest for turning its 2015 annual report into a lively Story Map Journal app. The story map included a video of a flower garden, audio of chirping birds, a financial statement, and informative photos and maps highlighting society projects such as the campaign to plant one million trees in the greater Philadelphia area. 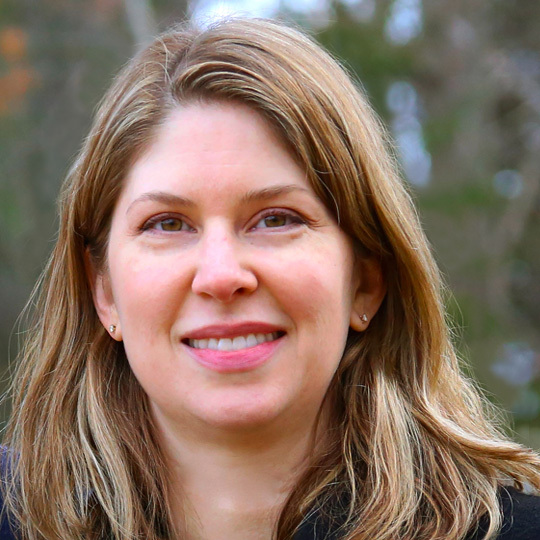 The story map’s creator was Lauren Medsker, research and analysis manager for the Pennsylvania Horticultural Society. She also won first place in the contest’s Conservation, Environment, and Sustainability category. Her prize was a free trip to the 2016 Esri User Conference (Esri UC) where the awards were announced. 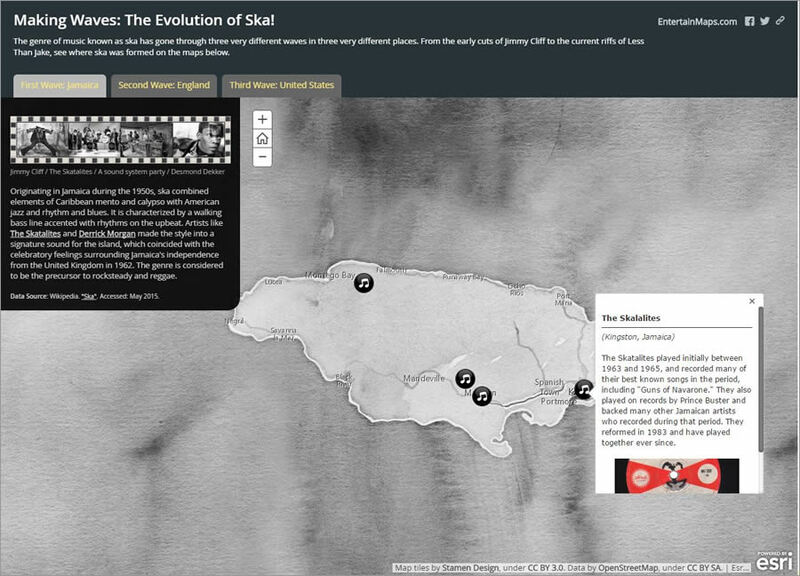 EntertainMaps.com's Mark Gallant embedded videos of ska bands into his story map. The contest, which invites organizations to create narratives using Esri Story Maps, had a record-breaking 965 submissions this year. “Esri Story Maps are a new medium that taps the insight of geography and the power of interactive maps to enable anyone to create beautiful, useful, and informative narratives about pretty much any topic under the sun,” said Allen Carroll, program manager for storytelling at Esri and one of the contest’s judges. Esri Story Maps combine the interactive maps created using Esri software with text and multimedia content such as photographs, video, audio, charts, and drawings. This year’s honorees were extremely creative. Mark Gallant from EntertainMaps.com embedded YouTube videos of artists and bands playing ska music in the story map, Making Waves: The Evolution of Ska! The story map won second place in the Culture/History/Events category. Kate Newell traced the history of Old Highway 99 through Bellingham, Washington. Birds in the Red Book of Armenia, a Story Map Journal app by Aghavni Harutyunyan, includes maps that show the habitats and beautiful drawings of birds in Armenia. The story map, which won third place in the Conservation/Environment/Sustainability category, is also bilingual, written in both Armenian and English. It was submitted by American University of Armenia, Acopian Center for the Environment in Yerevan, Armenia. Kate Newell from the City of Bellingham, Washington, who won in the Culture/History/Events category for the Old Highway 99 through the City of Bellingham story map. Newell traced the development of the highway through Bellingham, mapped the route, and highlighted some interesting historical attractions along the way, such as the Hamburger Express setup in an old electric railway car. Kathryn Strawn from the United States Department of Agriculture (USDA) Forest Service, who won in the Infrastructure/Planning/Environment category. Her story map, The 2015 Wildfire Season in the Pacific Northwest, documented the wildfire conditions that year in Washington and Oregon. The Story Map Journal app included a map of the locations of fires that were over 100 acres in size, along with an embedded timeline that shows worsening drought conditions. Emily Wilson and Joel Stocker from the University of Connecticut, who were the winners in the Science/Technology/Education category. They created Connecticut’s Coast: Then and Now, which uses imagery to explore how the state’s shoreline has been altered since 1934 by development, erosion, and other human activities and natural causes. 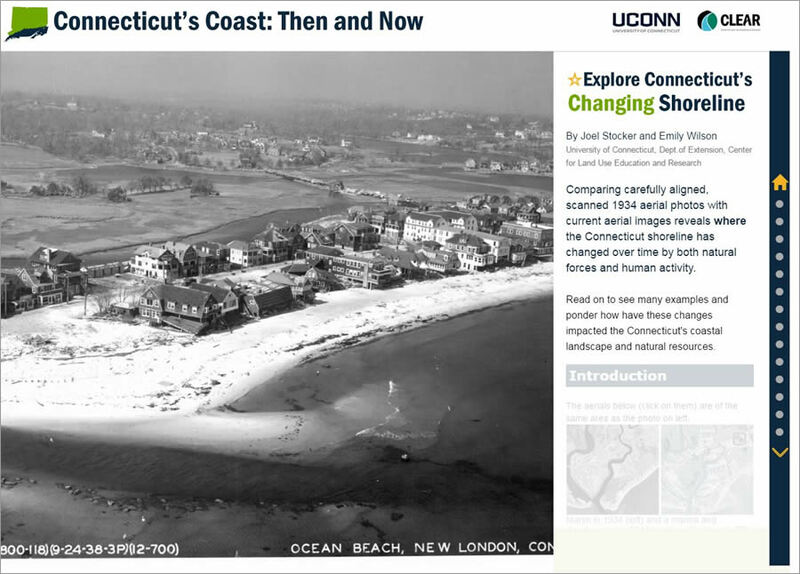 This story map from Emily Wilson and Joel Stocker of the University of Connecticut uses historic and current imagery to compare Connecticut's coast over time. Trisha Schlake from the Nebraska Game and Parks Commission, who won in the Travel/Destinations/Recreation category. Her story map, Missouri River Outdoor Recreation Access Guide, locates recreation sites along the Missouri River for camping, fishing, boating, and hiking. The story map also offers information on wildlife viewing and tips on how to avoid potentially dangerous rock dikes. Stephanie Smith from the Grand Canyon Trust for her story map Keep the Canyon Grand. Kyle Wikstrom from Brainerd, Minnesota, for his story map Timberwood Church Prayer Path. Brian Hettler from the Amazon Conservation Team in Arlington, Virginia, for his story map The Amazonian Travels of Richard Evans Schultes. 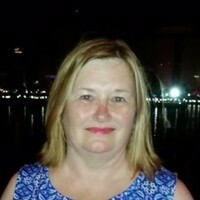 Janice Nollar-Conrad from the City of Moreno Valley, California, for her story map Retail iMap City of Moreno Valley—Economic Development. Tuan Nguyen from Rahall Transportation Institute—Marshall University in Huntington, West Virginia, for his story map Moving Towards Sustainability in Extraction Economies of Appalachia. Shannon Harmon, Andrew Lee, and Nicola Pearson from SciDev.Net in London, United Kingdom, for their story map Mapping Trachoma to Eliminate Blindness. Jennifer Lentz from the Aquarium of the Pacific in Long Beach, California, for her story map Southern California Steelhead. Andrew Mindermann from the University of Tennessee at Chattanooga for his story map Tennessee Valley Water Trails. Nataliya Lys from Douglas County GIS in Omaha, Nebraska, for her story map Your Map for Exploring Omaha’s Top Attractions. 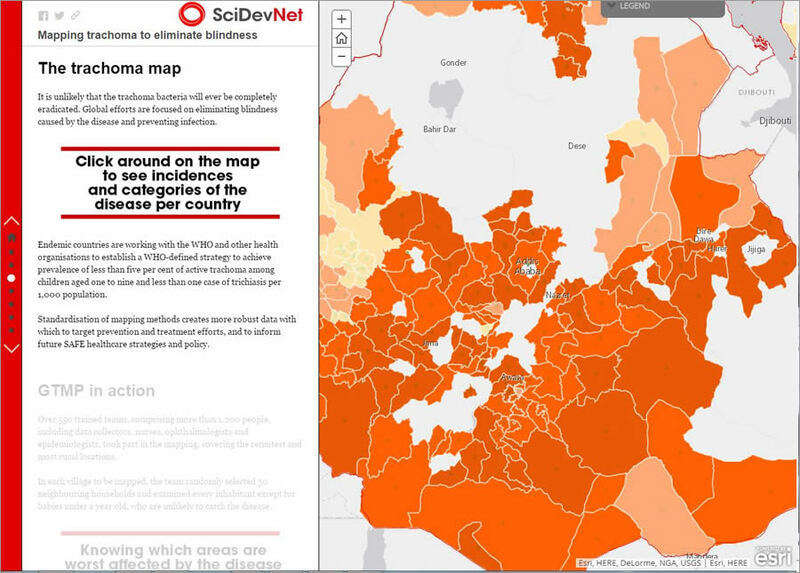 Shannon Harmon, Andrew Lee, and Nicola Pearson teamed up to create this story map to show where and how trachoma, a disease that can cause blindness, is being treated. The contestants used a variety of formats to create their story maps, including Story Map Tour, which presents a series of geotagged photos, and Story Map Journal, which combines long-form text with rich multimedia content. The use of story maps is exploding, with organizations creating them to share information with colleagues, project stakeholders, and the public. They are being used to showcase community events, communicate information about plans and projects, educate decision-makers, rally supporters, and crowdsource community observations and input. And now story map aficionados can try their hands at using two new apps, which Esri recently released in beta. Story Map Cascade has full-screen scroll capability to enable immersive media-rich experiences, and Story Map Crowdsource gives many users the ability to contribute to one story map, sharing photos, captions, and experiences. 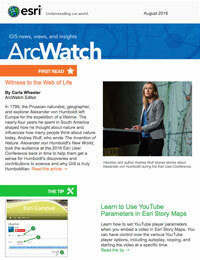 For more information about Esri Story Maps, visit storymaps.arcgis.com. 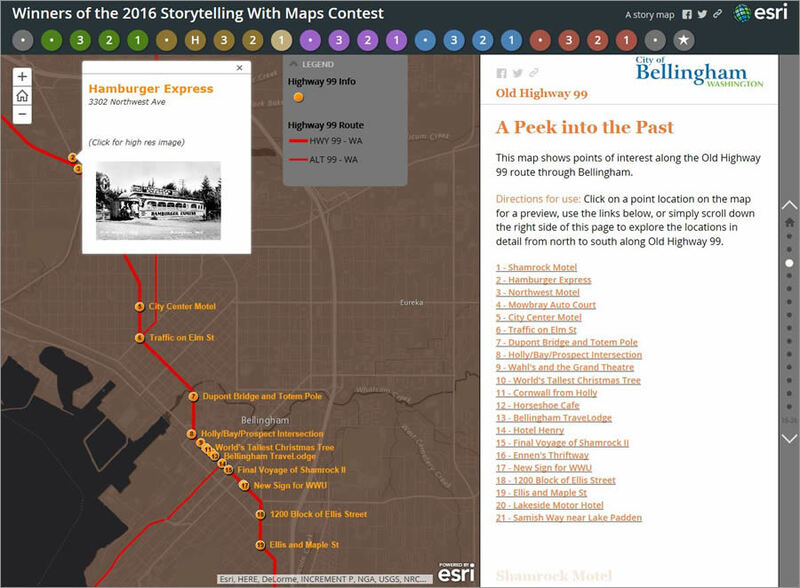 To view all 16 winning story maps, visit the winners’ gallery web page or the special 2016 Storytelling with Maps Contest story map. 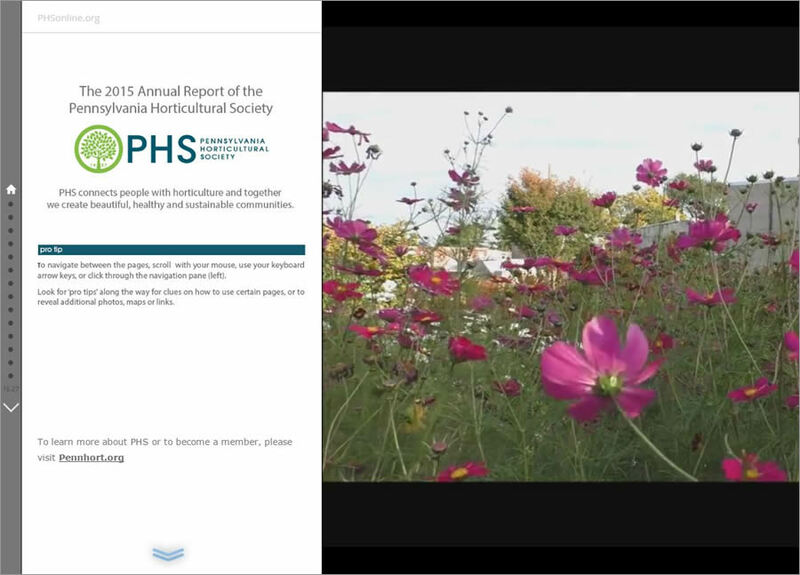 Watch an interviewwith Lauren Medsker about her story map on the Pennsylvania Horticultural Society’s annual report. ArcNews editor Citabria Stevens contributed to this report.